North Korea's TV programs always feature people speaking enthusiastically about their allegiance to the country's "Dear Leader." This prompted Russian documentary filmmaker Vitaly Mansky's curiosity: is their allegiance sincere? 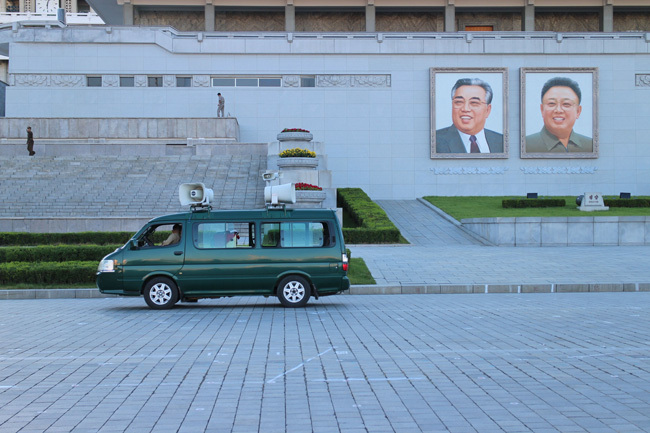 To get an answer, he and his film crew have visited Pyongyang, the capital, three times since 2013, hoping to learn what people really think. To try to get to the truth, Mansky carried out an in-depth interview and filmed the lives of Jin-mi, 8, and her parents, whom Mansky believed would give"candid and honest" opinions of their leader and state. But the director quickly realized that he had been naïve. "It was impossible to listen to their true voices in an official setting," Mansky told The Korea Times in Seoul. 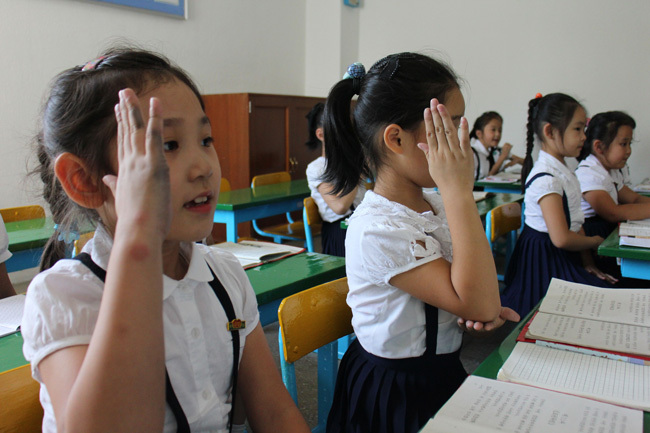 "Because the North Korean authorities strictly controlled everything, including every single word they (Jin-mi and her parents) speak to us and how to react to our requests and questions. "Everything was done in a tightly controlled and manipulated setting. We were not even allowed to talk with them during a coffee break." But such intervention did not derail his project. Rather it inspired the Mansky, 53, to pursue his original goal under cover. His team secretly filmed and recorded moments when the family did talk with their emotional guards down. He also peeked into the house at night through a telephoto lens installed in his hotel room one block away from the house. "I did the night shooting with my room's light turned off and the lens barely poking through the curtain," he said. Mansky then smuggled the unauthorized clips out of the North and produced a documentary titled "Under the Sun, laying bare the dismal reality facing North Koreans. He received several threatening letters from the reclusive state when the documentary was released last November, but he did not retreat. The film opened in South Korea last week. The following is an excerpt of the interview with Mansky. Q. How did you cast Jin-mi? We organized the film making with the North and the North cast Jin-mi. The scenario of the documentary was written by the North. Some episodes in the scenario were written in detail, instructing every move. Q. Why did you decide to make a documentary about North Korea? I was born in the Soviet Union when Stalin governed the state with communism and totalitarianism. Although many films were produced during the period, there was no film showing the reality of Russia under a communist dictator. Thus, I wanted to make a film telling about daily life under an authoritarian regime. Q. How long did it take to film the documentary? I went to the North with my proposal in 2013. After obtaining permission, I visited the country twice for filming in 2014. I stayed about 15 to 20 days each time. Q. How was the filming process? We could not meet the North Korean family without North Korean minders. When we tried to talk with them, the minders restrained us, saying, "Don't bother them." The minders instructed the family in every detail. For example, we had to reshoot because a minder pointed out that Jin-mi's father had ironed a cloth on the floor. He ordered Jin-mi's father to use an ironing pad. Q. Didn't you expect there would be some restrictions from the North? I did, but I didn't expect such strong restrictions. Q. How did the North hinder you from releasing the documentary? First, the North Korean foreign ministry made an official request to the Russian foreign ministry not to release the film because the documentary was made against the regime's wishes. The North also requested me to scrap the film and that I be punished. However, the Russian authorities refused the North's request, explaining there was no legal basis. After my documentary was screened and won an award at the Tallinn Black Nights Film Festival in 2015, the North sent me very kind messages, asking me visit the North for an important issue. However, I knew what would happen if I returned to the North. I am not stupid. Q. Are you afraid the North will retaliate? I think I can encounter retaliation. However, I believe telling the world the real state of the North Korean society has a certain value, so I will handle any retaliation. Q. Do you have anything you want to say to Jin-mi? I sincerely wish Jin-mi the best all the time. However, my wish is meaningless. As long as the North regime does not change, the life of Jin-mi won't change. They cannot even dream. Even dreaming is a luxury for children in North Korea.